Fig. 345 Female two-spotted spider mite, Tetranychus urticae (x60). 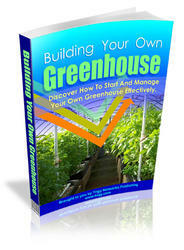 Europe, where they are associated mainly with glasshouse-grown plants. Heavily infested hosts are often coated in masses of webbing. 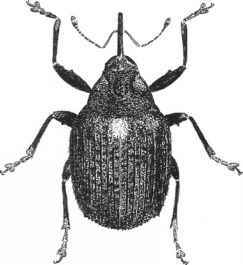 Unlike the previous species, with which they will interbreed, adults of Tetranychus cinnabarinus are bright red (both species have a pair of dark lateral markings); eggs are either whitish or pink and nymphs are greenish-yellow or green. 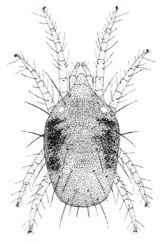 The mites lack a diapause stage and, under suitable conditions, breed continuously.